North of the town of Boulder Creek, there are several tributaries of the San Lorenzo River that meander up either side of the valley's walls. Bear Creek, the second such stream, hosted several lumber mills along its length over the years, but the mill operated by the Alameda Lumber Company, owned by Austin S. and Oscar R. Harmon, was the longest-lived and most well known. The brothers were natives of Maine but moved to the San Lorenzo Valley in 1867 to work at Joseph W. Peery's mill on Two Bar Creek. After that mill closed, they tried some other professions before returning to the lumber industry. 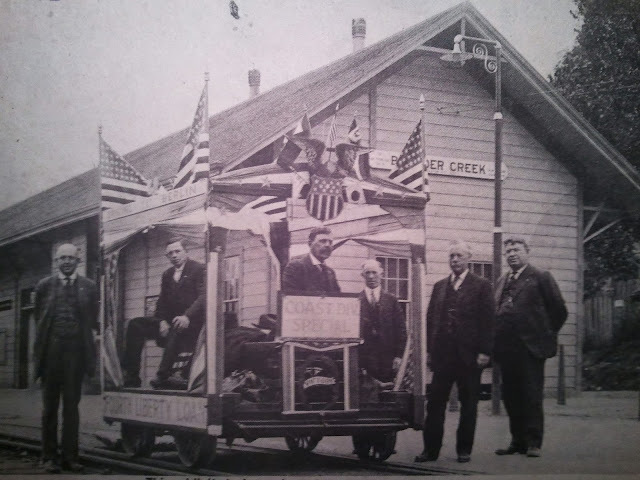 In 1873, the brothers founded the Bear Creek Toll Road Company and spent two years creating a road between the small town of Lorenzo and Lexington south of Los Gatos. The goal of the project was to make it easier for lumber and split stuff to be hauled out of the upper San Lorenzo Valley to the Santa Clara Valley. 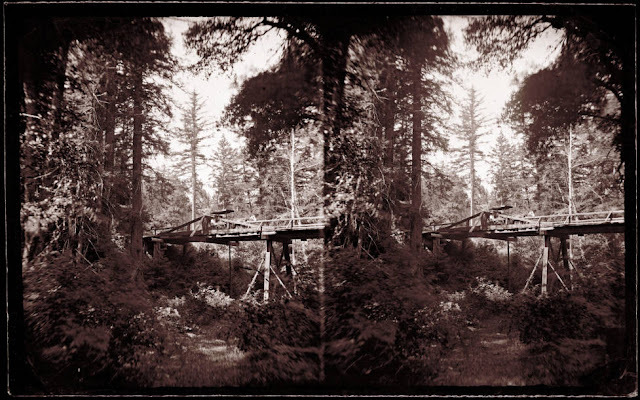 Unfortunately for the Harmons, though, soon after the road was built, the San Lorenzo Valley Flume was completed, creating a more efficient and easier way to ship out lumber. 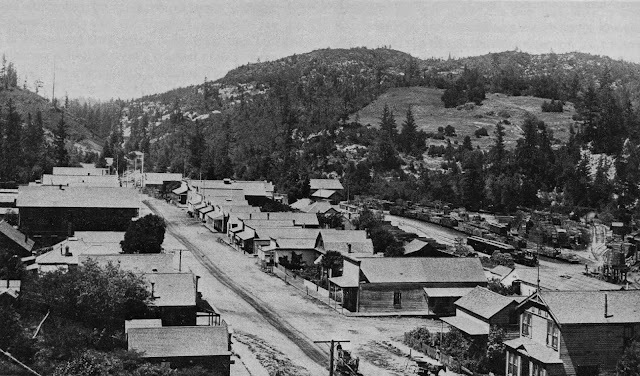 Santa Cruz County eventually purchased the failed toll road in 1890 and it became Bear Creek Road. Once the flume was built and the unprofitability of the toll road proven, the Harmons decided to return to the lumber business. In 1876, the brothers incorporated the Alameda Lumber Company and began purchasing timberland north of Boulder Creek. 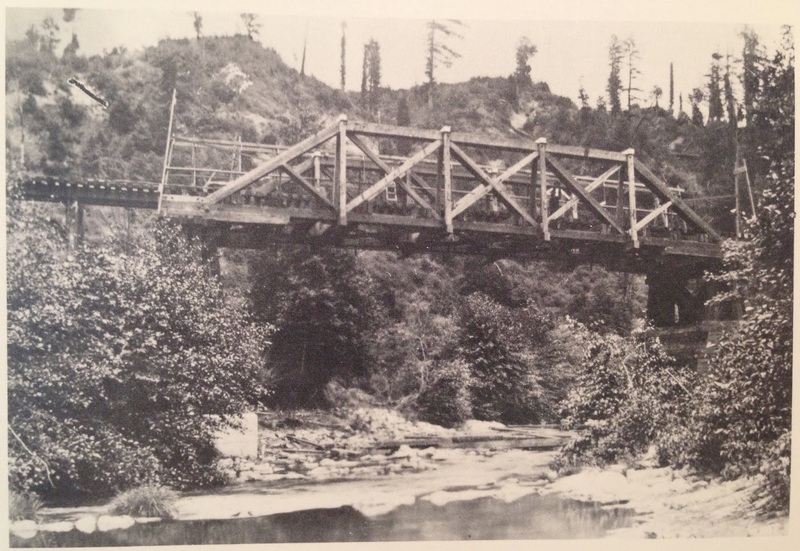 They purchased several tracks on either side of the San Lorenzo River about a quarter mile north of town, but their main tract was up a seasonal tributary of Bear Creek now called Harmon Gulch. Like many other lumber firms in the area, the Harmons harvested lumber on their own lands as well as on adjacent lands through lease agreements. For its first few years, the Harmon Gulch mill was a relatively small-scale affair that focused primarily on cutting railroad crossties. All of the cut timber was hauled to the small mill via oxen teams that dragged the cut logs down skid roads to the mill near the gulch's base. From there, they likely shipped the ties over their toll road to Lexington and beyond. In 1880, the brothers gave up completely on their road and began sawing lumber to send downstream along the flume at the bottom of Bear Creek. The arrival of the Dougherty Extension Railroad in August 1887 replaced the increasing problems with the flume and provided the Harmons with a truly profitable way to ship their lumber. While no railroad tracks ever came near the mill, a spur at the bottom of Bear Creek was probably installed for the mill's use. By 1889, the mill had a daily capacity of 10,000 board feet of lumber and employed 45 men. A series of tragedies led to an eventual end to the Harmon Brothers' venture up Harmon Gulch. In 1887, Austin Harmon died from a head wound received in the field. Three years later, the mill burned down, although Oscar Harmon rebuilt. At the end of the 1898 cutting season, Oscar retired and sold the land to J. H. Olsen, who sold the property to the Santa Clara Valley Mill & Lumber Company two years later. Oscar, meanwhile, died in 1899. The remaining timber was harvested throughout 1901 and then the mill was sold to the Enterprise Lumber & Development Company, which ended up abandoning the structures and machinery the next year. The site of the mill still hosted machinery into the 1920s, at which time it disappeared and was developed into a private residence. Its location was probably in the vicinity of Fernwood Drive across from Harmon Gulch Road approximately 2.5 miles up Bear Creek Road. The Southern Pacific Railroad Company became the sole provider for railroad service in Santa Cruz County in 1887 (although the Ocean Shore Railroad, San Juan Pacific Railway, and Pajaro Valley Consolidated Railroad all attempted to rival their dominance briefly). To manage its railroad lines, routes were divided into divisions, subdivisions, and branches. Several such lines emerged over the years, most of which began life as independent companies, but when the Southern Pacific became the Union Pacific Railroad in 1996, only the Santa Cruz Branch and the Monterey Branch remained under company control, and both only briefly. Coast Div ision employee timetable No. 147 cover, dated March 30, 1940. 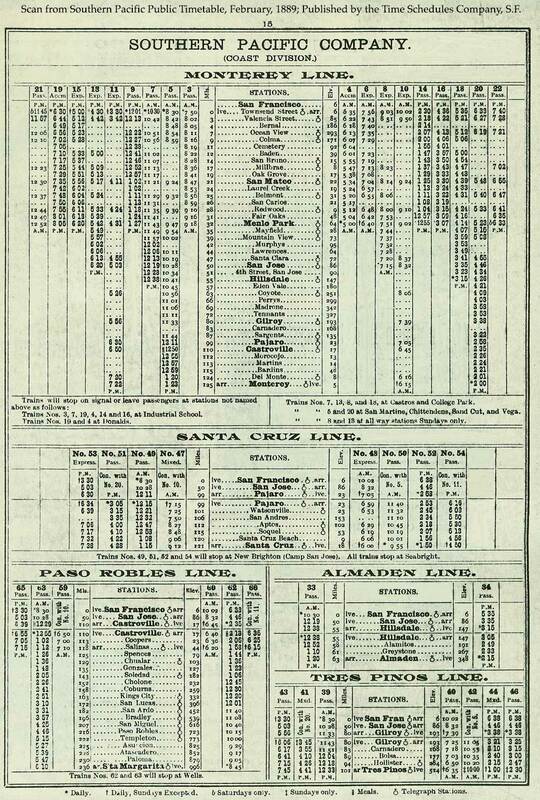 This was the last published timetable that included the San Jose & Santa Cruz Branch through the Santa Cruz Mountains. The very first Southern Pacific branch line, predating the creation of any divisions or subdivisions, was built continuously from 1871 to 1874 from Gilroy to Salinas. In the beginning, it was a route meant to link the Santa Clara Valley’s railroad lines with the agricultural lands of the Salinas Valley while also conveniently passing through Watsonville and near Monterey. But early plans to go through Watsonville were quickly replaced with a route through Pajaro to the south. In the end, the only portion of Santa Cruz County reached by this branch was the tiny settlement of Chittenden. As early as April 1872, it was common knowledge that the originally-planned Southern Pacific route to the San Joaquin Valley via Hollister would not be economically viable and that the coastal route through Salinas would likely become the main line. Neither proved true, however, as Southern Pacific instead chose a line down the center of the San Joaquin Valley as its main line. 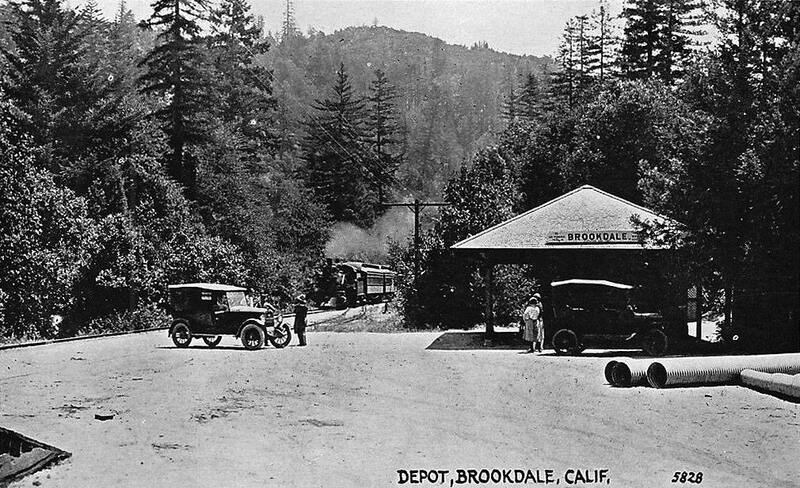 When this happened, the Watsonville Branch became the trunk of the Northern Division and the original trunk through Hollister became the Tres Pinos Branch. When Southern Pacific began building railroad lines in Southern California in the early 1870s, it had a problem: these lines were disconnected from the lines in Central and Northern California. Thus, the first solution to this problem was the creation of the Northern Division, Southern Division, and Colorado Division. At some point around 1888, a portion of the Northern Division split off to become the first Coast Division, which included the Monterey Bay trackage. However, this early version of the Coast Division was later reimagined. Within the Monterey Bay area, three branches fell under the jurisdiction of the Northern Division. 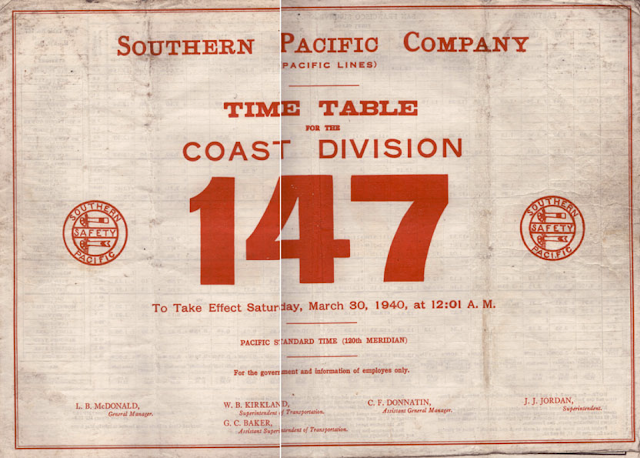 1889 Southern Pacific Coast Division timetable. Beginning life as the Santa Cruz Railroad between Pajaro and Santa Cruz, this line was consolidated with the Loma Prieta Railroad on June 3, 1884 to form the Pajaro & Santa Cruz Railroad. 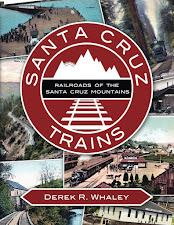 On May 4, 1888, Southern Pacific absorbed the subsidiary railroad and it became the Santa Cruz Line. In 1892, it was renamed the Pajaro & Santa Cruz Branch and retained this name until 1912, when Pajaro was renamed Watsonville Junction. Rather than use a long and clunky term for the branch line, Southern Pacific instead decided to simply call it the Santa Cruz Branch, although this name was sometimes confusingly applied to the route through the mountains as well. The line had several unofficial names over the years including the Watsonville & Santa Cruz Branch, the Pajaro Branch, and the Watsonville Junction & Santa Cruz Branch, and all combinations thereof. 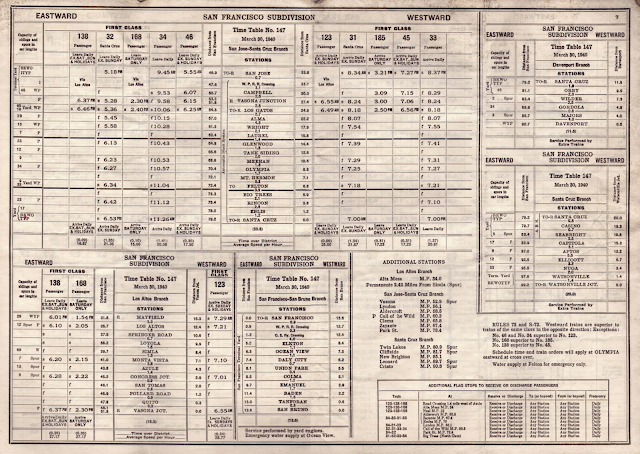 None of these were used in an official capacity by the railroad but appeared in newspaper timetables and other media. As soon as the Loma Prieta Railroad between Aptos and Monte Vista was completed in the summer of 1884, the company was consolidated into the Pajaro & Santa Cruz Railroad subsidiary of Southern Pacific. In 1888, the company extended the right-of-way three miles to the second Monte Vista and the foot of Five Finger Falls along Aptos Creek and, after this was completed, the company was absorbed into Southern Pacific and became the Loma Prieta Line, renamed the Loma Prieta Branch in 1892. For the next twenty years, the line was in irregular use, serviced primarily by extras or by Loma Prieta Lumber Company locomotives. 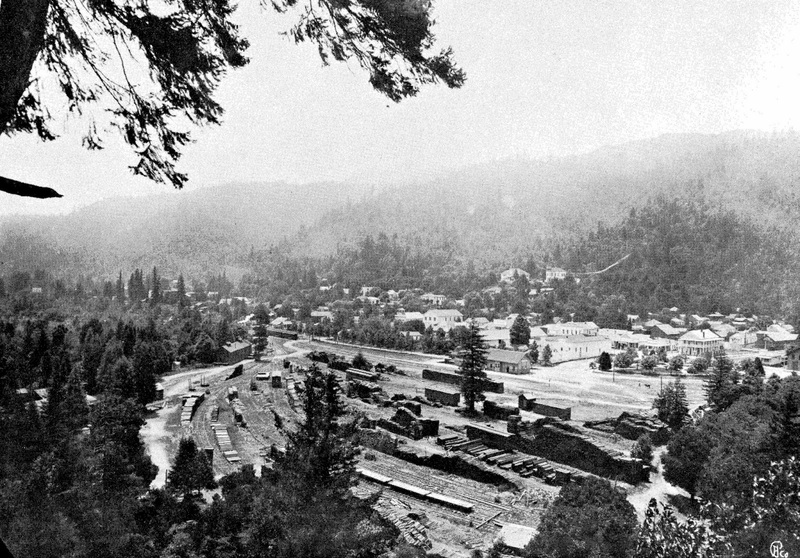 The three miles of trackage added in 1887-1888 were destroyed by a landslide in 1899 and the trackage was soon afterwards cut back to just six miles, ending just beyond the rapidly declining town of Loma Prieta. Other operations in the area, however, ensured that operations continued in some capacity until the end of 1921. Southern Pacific waited until November 30, 1927 to petition for the abandonment of the route, which was granted in early 1928. It disappears off station books the next year, but continued to be referenced by employee timetables until 1930. The narrow-gauge Monterey & Salinas Valley Railroad between Monterey and Salinas was taken over at auction in December 1879 and early the following year became the Monterey Railroad, a Southern Pacific subsidiary. Southern Pacific standard-gauged the route almost immediately and redrew the right-of-way between Castroville and Monterey. The line was extended to Lake Majella south of Pacific Grove through the Monterey Extension Railroad between January and May 1888, but on May 14, both companies were absorbed by Southern Pacific and became the Monterey Line. From 1888 until 1892, the line included all of the mainline trackage between San José and Pacific Grove. It was even briefly renamed the San Jose & Pacific Grove Branch in 1892 before the route was cut back to Castroville in 1895 and became the Castroville & Pacific Grove Branch. 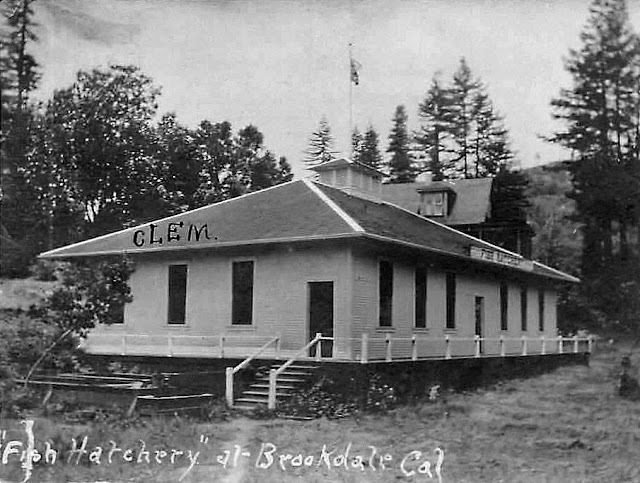 It finally was named the Monterey Branch in June 1907 and has remained under that name ever since. The Monterey Branch was popular due to the presence of the Hotel Del Monte, which opened on June 3, 1880 and continued to operate as a hotel until just after the start of World War II. The Monterey Express (later Del Monte Limited, Del Monte Express, and finally just Del Monte) began running along the line at this time as a regular named passenger train. During much of its history, the branch was nicknamed the Del Monte Branch to both reflect the popularity of the hotel and the renaming of Castroville's station to Del Monte Junction. The last run of the Del Monte was on April 30, 1971, after which all passenger service to Monterey ended. The tracks between the quarry at Seaside and Lake Majella were abandoned in early 1979 following approval by the Interstate Commerce Commission on December 29, 1978. Three years after Southern Pacific's merger with Union Pacific in 1996, the Monterey Branch was formally abandoned and the branch cut off at Castroville. While the trackage remains in place all the way to Monterey (often under paved bicycle/hiking paths), it currently is unable to be used. Strictly speaking, the track no longer constitutes a branch line since the sixteen-mile route was purchased by the Transportation Agency for Monterey County (TAMC) in 2003 for $9.3. Plans are in place to rehabilitate the line for passenger and freight use, but nothing has been done yet. The portion of the original South Pacific Coast Railway route between the Bay Area and Santa Cruz changed names several times over the years. 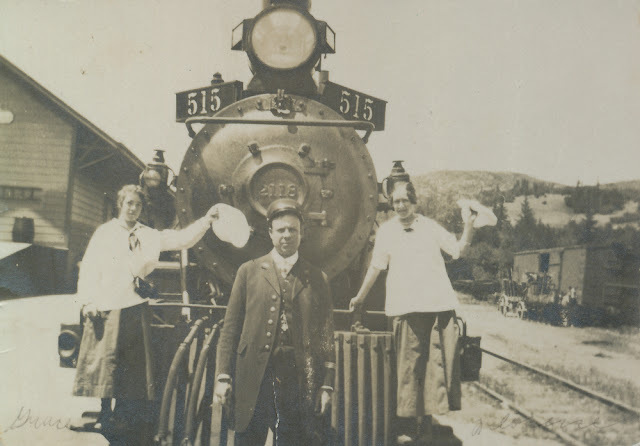 When it was first leased by Southern Pacific on July 1, 1887, all of the narrow-gauge trackage became known as the South Pacific Coast Railroad Division. This proved to be a rather short-lived entity. On July 1, 1892, it was replaced by the Santa Cruz Division, but this proved equally short-lived. Also, in a rather comedic twist, it only included two narrow-gauge branches within the county—the other trackage within the county remained a part of the Northern Division while the division as a whole retained oversight of most of the former South Pacific Coast trackage. In 1897, the entire route was demoted, at least in station books, to a subdivision. 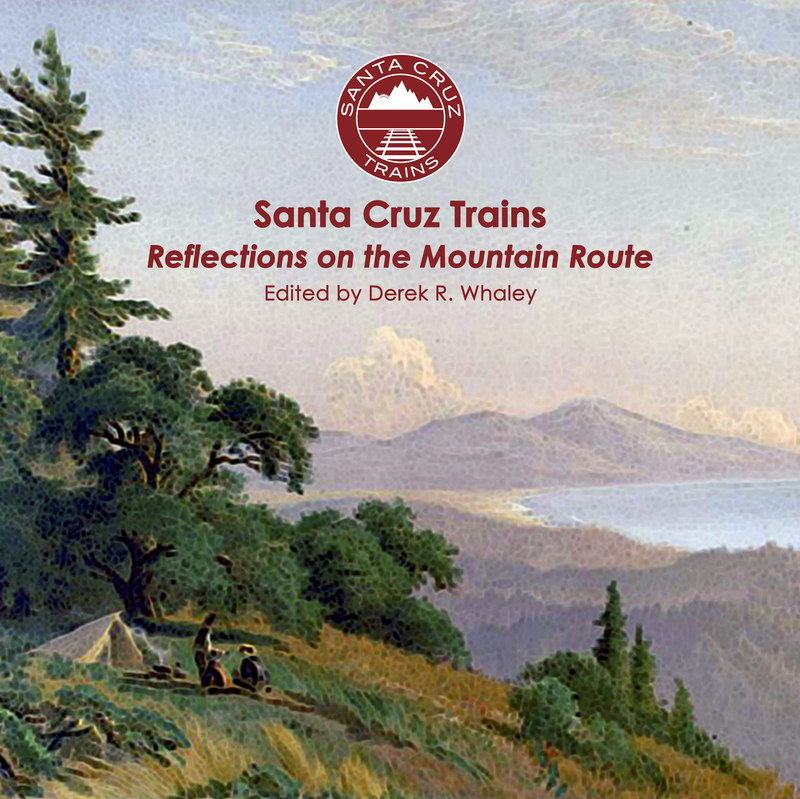 The narrow-gauge railroad route through the Santa Cruz Mountains may have begun as a main trunk line of an enterprising railroad, but from 1887 it was demoted to simply a branch line, albeit a significant one. From 1892, the route was named the San Jose and Santa Cruz (Narrow Gauge) Branch on employee timetables, while station books called the route the Narrow-Gauge Subdivision. It was also alternatively called the Mountain Division, the Los Gatos-Santa Cruz Branch, and the Santa Cruz Cut-off in newspapers, although none of these were official names. The standard-gauging of the line that began in 1895 and was completed in 1909 prompted a change in status for the trunk of the former South Pacific Coast line. The route became the Santa Clara & Santa Cruz Branch. A slight realignment in its northern terminus led the name to change to the College Park & Santa Cruz Branch in 1912, a name that stuck for most of the rest of its existence. At some point during the height of the Great Depression, the route was changed one last time to the San Jose & Santa Cruz Branch. The disastrous winter storm of February 26, 1940 heavily damaged this line which led Southern Pacific to file for abandonment on March 25. During this time, the route was referred to frequently as the Los Gatos-Olympia Branch, although this was strictly an informal term referring to the section undergoing debate. Formal abandonment was approved November 7 with the surviving ends of the line divided between a new Los Gatos Branch on the northern end and the Santa Cruz Branch on the southern, which annexed the trackage to Olympia. This latter section was briefly informally called the Santa Cruz-Olympia Branch. The Felton & Pescadero Railroad between Felton and Boulder Creek was consolidated into the South Pacific Coast Railway on May 23, 1887, which was leased to Southern Pacific a month later. 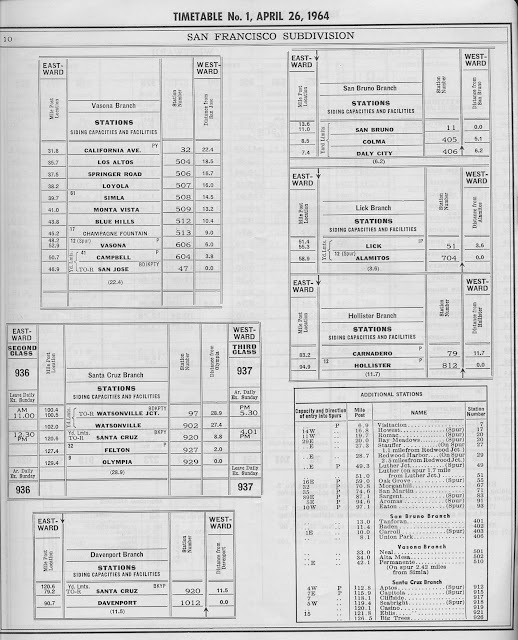 Southern Pacific continued to use the Felton & Pescadero branding for several years but timetables renamed it the Felton Branch. It continued to operate under this title until 1912, when the name switched to Boulder Creek Branch. Following the collapse of the lumber industry and difficult years after the stock market crash in 1929, Southern Pacific petitioned the Interstate Commerce Commission for abandonment on August 30, 1933. The petition was approved on November 14 and the line abandoned on January 26, 1934. This three-mile line began life as the northern portion of the Santa Cruz & Felton Railroad's right-of-way. When South Pacific Coast acquired the line on January 1, 1880, the portion between Felton Junction (across the river from Big Trees) and downtown Felton was reduced to a long spur with its own stations. Soon after the San Francisco Earthquake in 1906, the spur was upgraded to the Old Felton Branch, a name that referenced its northern terminus and attempted to avoid confusion with the Felton Branch. The branch only last two years, though, after which it was abandoned and the northernmost mile converted into a standard-gauge spur of the Felton Branch. 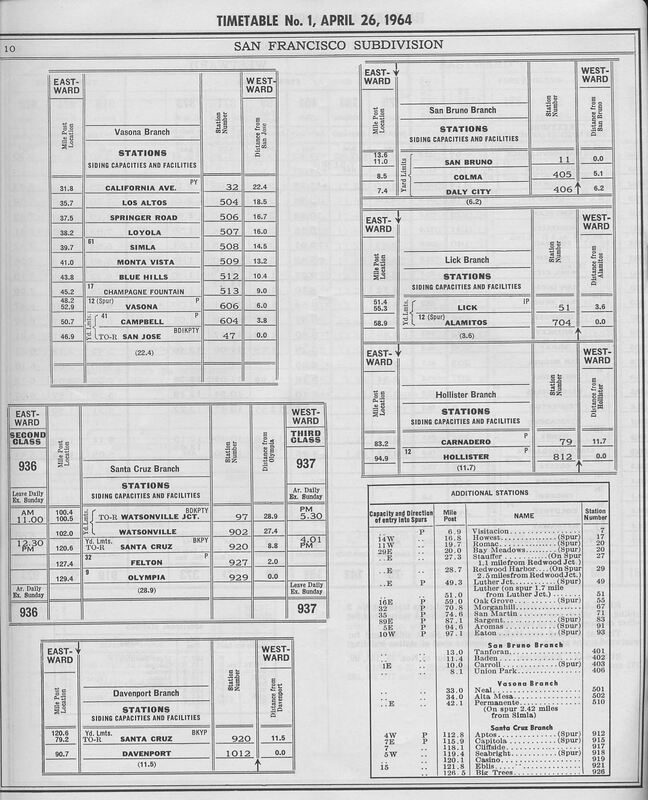 Interior page from Coast Division employee timetable No. 147 (March 30, 1940) showing various routes within Santa Cruz County. A massive reorganization of Southern Pacific occurred on July 1, 1892, and the original Coast Division was impacted quite heavily. Besides the Santa Cruz Division, an enlarged Coast Division was created that covered all of the former Northern Division trackage between San Francisco and Santa Barbara, excepting the narrow-gauge track formerly belonging to the South Pacific Coast Railroad. 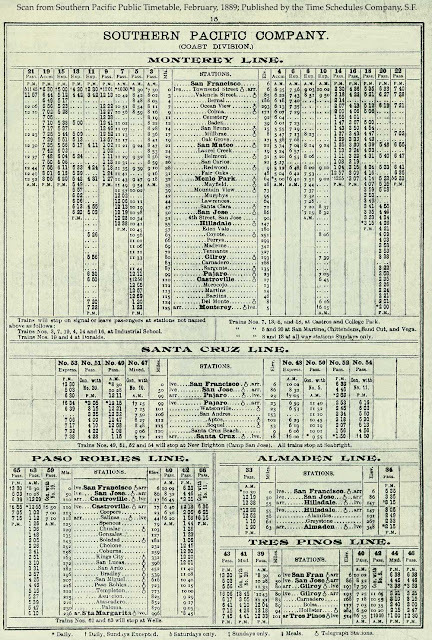 The Santa Cruz Division and Coast Division began appearing on the same timetables on September 3, 1896, until the former was absorbed into the latter on September 27, 1897. Throughout the system, subdivisions were created to handle specific areas within each division. Following the San Francisco earthquake of 1906, all of the unconverted trackage of the former South Pacific Coast Railroad was standard-gauged and the entire subdivision rendered moot. The tracks along the west San Francisco Bay, expanded with the addition of the Narrow Gauge Subdivision in 1907 and the Los Altos Branch in 1908, formed the San Francisco Subdivision. In 1912, the name was lengthened to the San Francisco & Watsonville Junction Subdivision, but the longer title was truncated back to the original in 1930. The subdivision continued to exist until 1987, although all of the Santa Cruz and Monterey County trackage eventually became associated with other subdivisions except for the period 1985 to 1987. 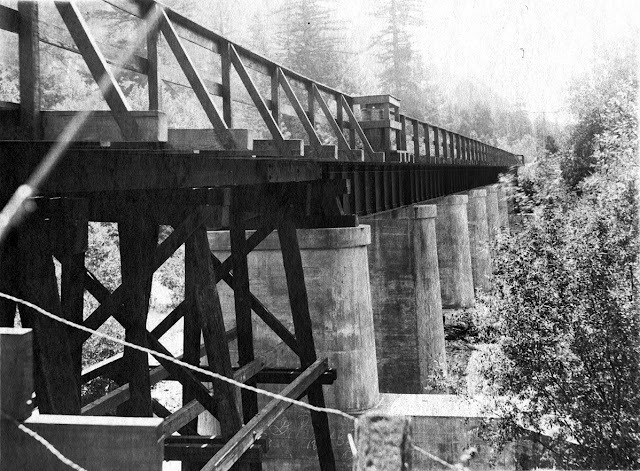 The shortest branch line in Santa Cruz County, the one-mile route to the California Timber Company mill on Newell Creek was installed by Southern Pacific in 1905. After the San Francisco Earthquake, the line to the mill was standard-gauged and the railroad upgraded its status to the Newell Creek Branch around October 1908. All of the trackage north of the mill continued to be narrow-gauge and was privately owned by the lumber company. The mill shut down in 1913 but the branch remained in station books until 1920, when it was formally abandoned. This line began life as the Coast Line Railroad, but as early as July 1907 local newspapers called it the Davenport Branch and on August 24, 1917, the name change became official when Southern Pacific absorbed its subsidiary. Regularly-scheduled passenger service along the line ended on July 21, 1932, although excursion trains continued through the 1950s. The line was annexed to the Santa Cruz Branch around 1985 after the Santa Cruz to Olympia trackage was sold to Roaring Camp Railroads. As a part of the Santa Cruz Branch, it was sold to the Santa Cruz County Regional Transportation Commission in 2012. The northern three miles of the former College Park & Santa Cruz Branch survived for nineteen years as the Los Gatos Branch until the people of Los Gatos requested that Southern Pacific abandon its route through downtown. On June 16, 1958, the petition was filed with the Interstate Commerce Commission and abandonment was approved on December 30. Formal service ended on January 23, 1959 and the final run happened on January 25, which concluded with a spike-pulling ceremony overseen by Coast Division superintendent R. A. Miller. The right-of-way was quickly converted into parking lots by the town of Los Gatos. When the mountain route was officially abandoned in November 1940, the Los Altos Branch was renamed the Vasona Branch and the name Mayfield Cut-Off went into disuse since it no longer cut off the route between Santa Cruz and San Francisco. When the Los Gatos Branch was abandoned in 1959, the stop at Vasona Junction became the commuter terminal for Los Gatos area passengers. Low patronage at the station and plans to cut the Vasona Branch between Simla and Alta Mesa to make room for Foothill Expressway in 1962 led to a petition to abandon the station on March 21. But the Interstate Commerce Commission provided a brief reprieve on October 25, 1963 when it disallowed Southern Pacific from ending service between the points, in effect also delaying construction of the expressway. After another petition to the ICC, abandonment was approved and the last run along the branch occurred on January 27, 1964. The portion of the track south of Foothill Expressway continues to exist today as a freight line ending at the Lehigh Permanente quarry to the west of Cupertino. 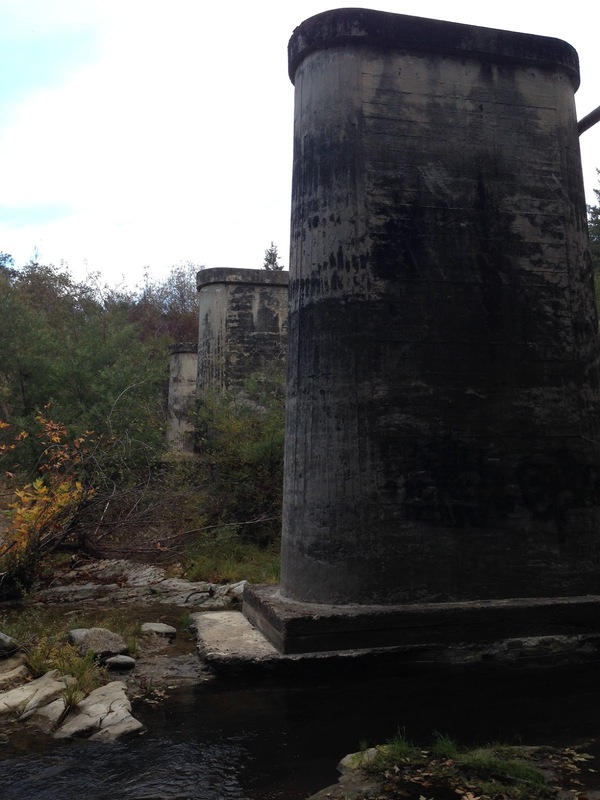 Discussions to rehabilitate this line and even extend it to the outskirts of Los Gatos have been discussed for over two decades but no progress has been made. At some point in the mid-1930s, the San Francisco Subdivision was divided and the Monterey Branch became a part of the new Salinas Subdivision. This route included all the trackage from Watsonville Junction up the Salinas Valley to San Luis Obispo, at which point the Guadalupe Subdivision continued to Santa Barbara. In 1964, the subdivision was extended north to San Jose and both the Santa Cruz and Davenport Branches became a part of it. In 1985, the Salinas Subdivision was dissolved and all Monterey Bay branches once more became a part of the San Francisco Subdivision. In 1942, a new Gilroy Subdivision appeared to handle traffic between San Jose and Watsonville Junction and it included the Santa Cruz and Davenport Branches. The subdivision was dissolved in 1964 and both branches were annexed to the Salinas Subdivision. 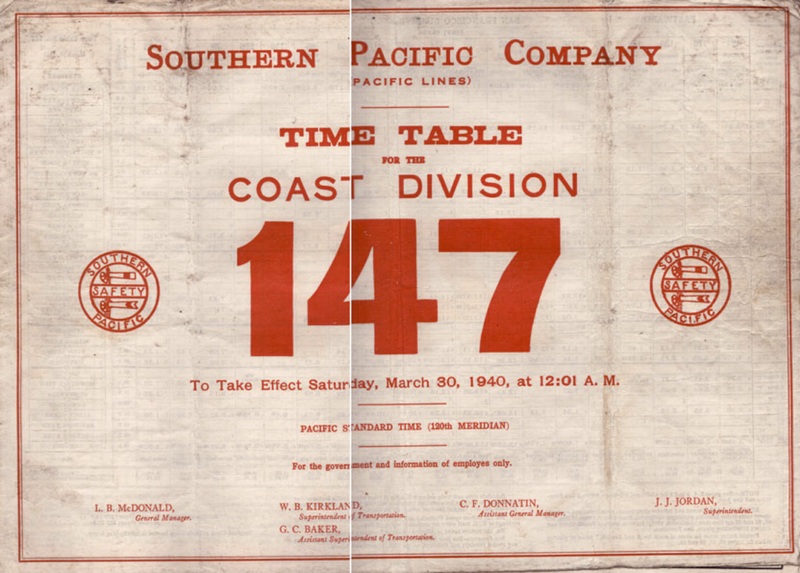 In its later years, Southern Pacific shifted their focus along the Central Coast to freight, which led to smaller timetables and fewer passenger schedules. In 1964, the Coast Division became the Western Division and annexed several neighboring divisions in the process. In 1985, the division system was abandoned and Santa Cruz County fell into the Northern Region and, in 1987, the Western Region. It remained within that region until Union Pacific took over in 1996. Within the Western Region, local trackage fell under the authority of the Coast District, a spiritual successor to the Coast Division. 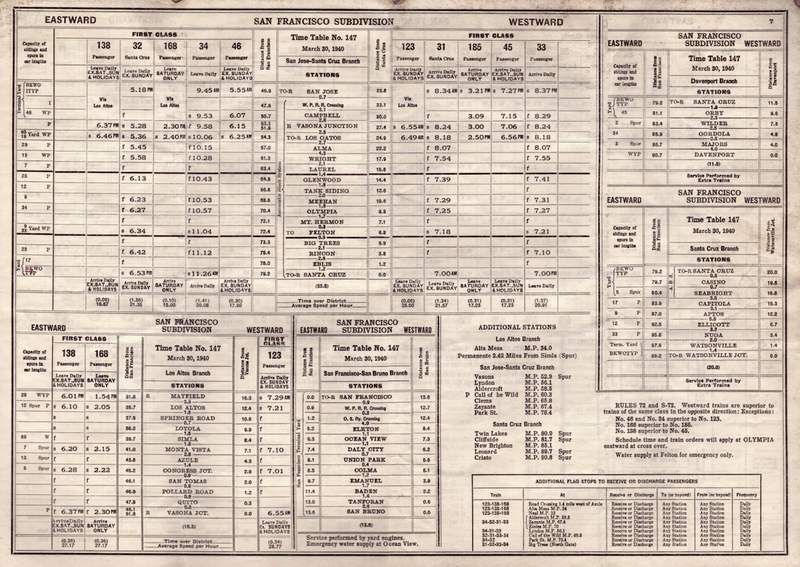 A page from the first Western Division employee timetable, April 26, 1964. Bender, Henry. Various valuation summaries for relevant branches and stations. 2014-2019. Harrison, Greg. Abandoned Rails. 2019. 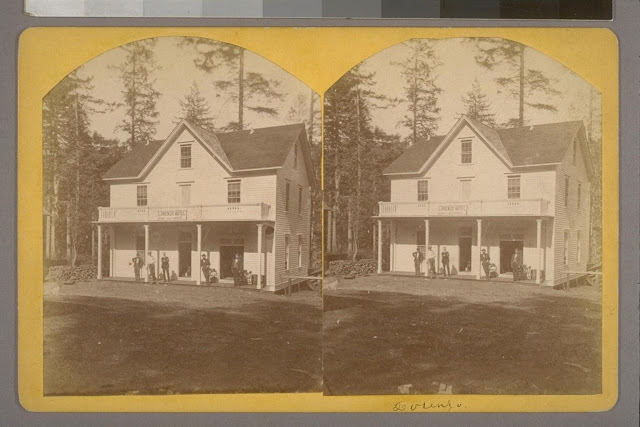 Cottrell's general store, Lorenzo, c. 1878. The town of Boulder Creek eight miles north of Santa Cruz along the San Lorenzo River doesn't really feel like a homogenous place. In the hills around it are small communities of people who visit the town to buy groceries or refuel but otherwise just commute on through—places like Wildwood, Bracken Brae, Forest Park, Little Basin, Riverside Grove, and San Lorenzo Park, among others. In the town itself, there is a rather obvious geographic division between those who live south of Scarborough Lumber and those who live north, differentiated by a slight curve in State Route 9 and a low hill. For certain, all of these places are a part of Boulder Creek, but the town was not always a single unit. In the beginning, there were two towns: Boulder and Lorenzo. In January 1875, just months before the San Lorenzo Valley Flume & Lumber Company constructed its v-flume through the area of the Turkey Foot—the confluence of Bear and Boulder creeks into the San Lorenzo River—Joseph Wilburn Peery set to work incorporating a town he named Lorenzo. He bought a lumber mill owned by Frank L. Pitt that ran off water from the intermittent Harmon Gulch creek and used it to attract lumbermen and others who could support a town. The settlement included precisely what one would expect to find in such a rugged environment: saloons, places of ill-repute, a few hostelries, and a growing number of private homes. Peery's mill had come to him via Pitt, but Pitt wasn't its first owner either. It began life as the Sylvar mill and was little more than a shingle mill and tannery. Peery upgraded some of its facilities but continued using it for its original purpose. Some lumber was produced there and used in the construction of homes in the area, but the mill primarily focused on the more valuable split stuff. 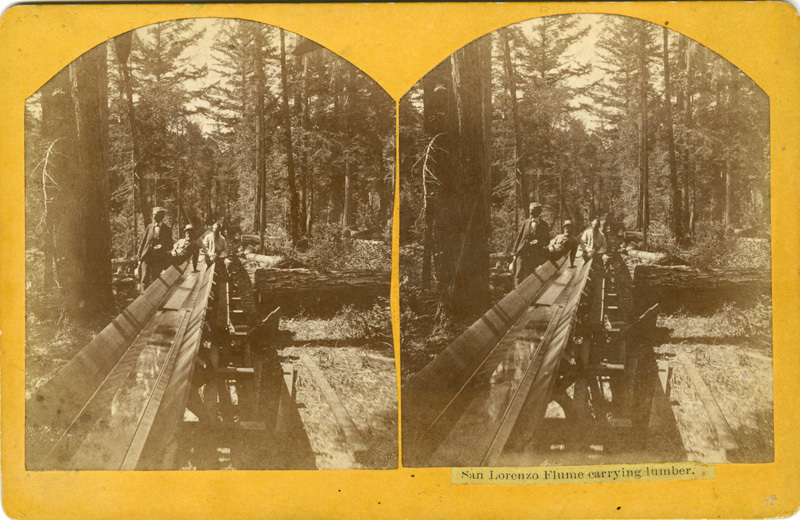 Excess lumber was loaded onto the flume and shipped to Felton from 1875 to 1885. 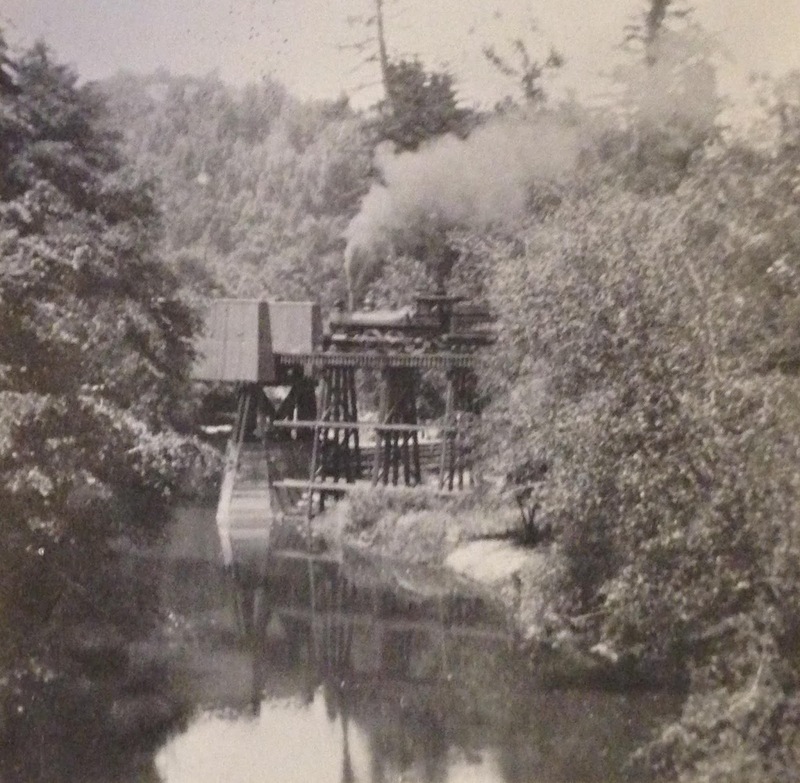 Although the flume helped Peery's lumber operation, it did little to help his town. The flume company had purchased a large lot half a mile north of Lorenzo so that flume traffic could be sorted and loaded efficiently. 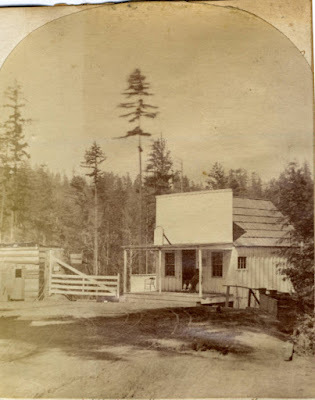 For a brief time, Lorenzo served as the primary settlement catering to the flume's operations and even managed to convince the local post master to relocate to the back of a saloon in Lorenzo. But the residents of the smaller settlement of Boulder one mile to the north revolted, arguing that one should not have to go into a saloon to send mail. Boulder at this time was a dry town. In 1877, the post office returned to Boulder and Lorenzo's decline soon followed. L.S. & P. Mill & Tannery, located on J.W. 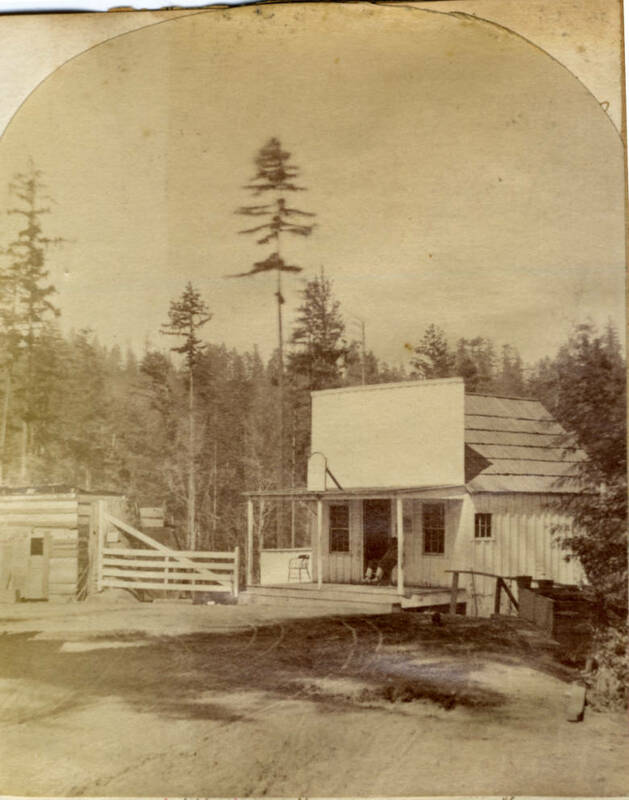 Peery's property in Lorenzo, c. 1880s. In 1883, Lorenzo petitioned the newly-formed Felton & Pescadero Railroad to establish Lorenzo as its northern terminus. The railroad declined due to the fact that it owned the large flat that had previously served as the flume sorting area. The residents of Lorenzo certainly did not help matters—they demanded such high prices for property that the railroad took a circuitous route around the town, almost entirely avoiding it. 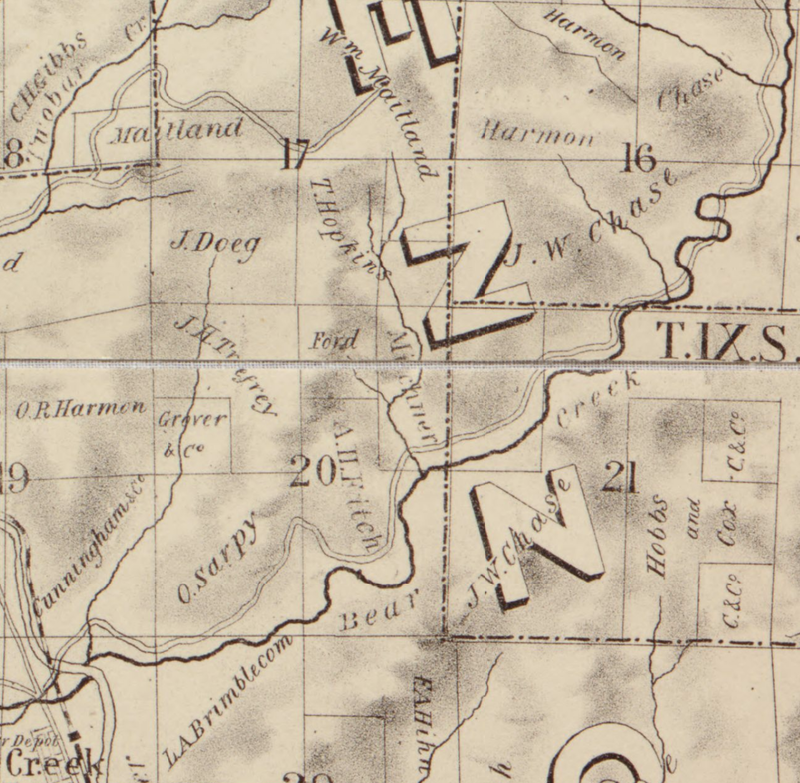 Peery's mill received a station called Lorenzo which initially served as the terminus while construction was finished further to the north, but then the new station of Boulder Creek located closer to Boulder became the line's new terminus. Lorenzo declined sharply over the next decade. 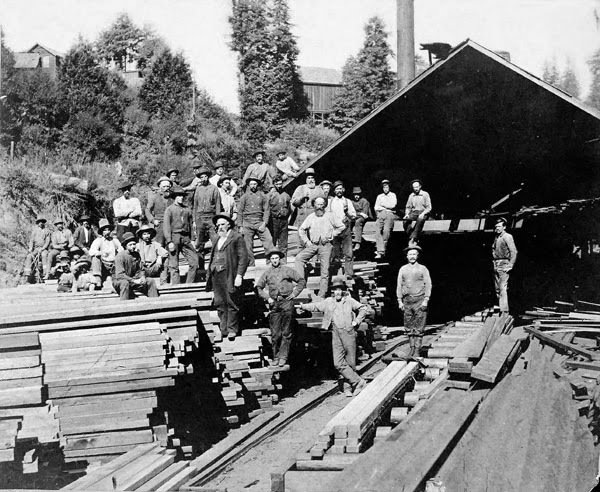 Peery convinced the railroad to build a 556-foot-long siding at his mill so that he could continue to ship out lumber, split stuff, and tanned hides. Nonetheless, service to the station was so low that Southern Pacific demoted it to a flag-stop when they took over in 1887. 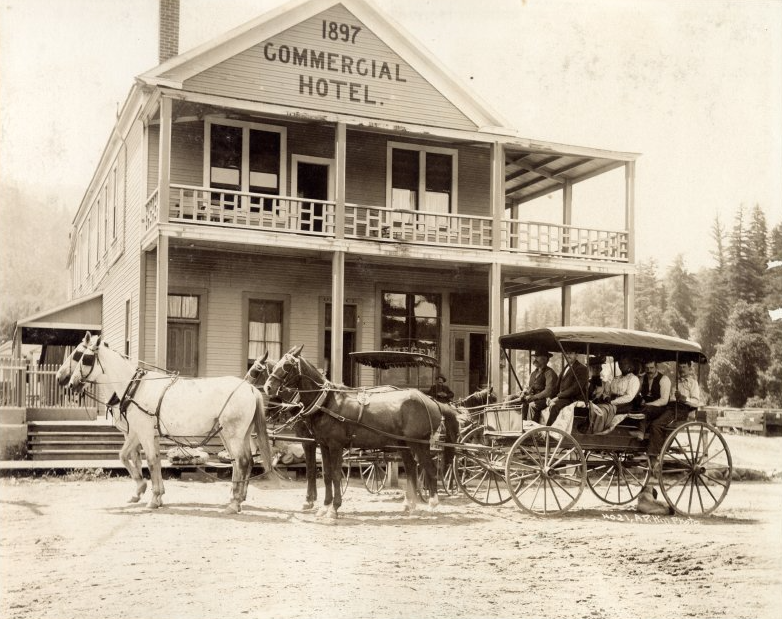 Then in 1897, a kitchen fire spread throughout the town, destroying the two major hotels, the town hall, and other buildings along the county road. Peery briefly attempted to rebuild, but gave up within a year, selling his mill to Joseph Lane. 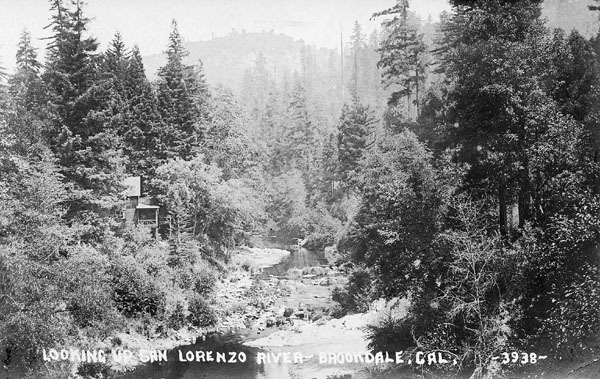 Lorenzo was soon afterwards incorporated into Boulder Creek. 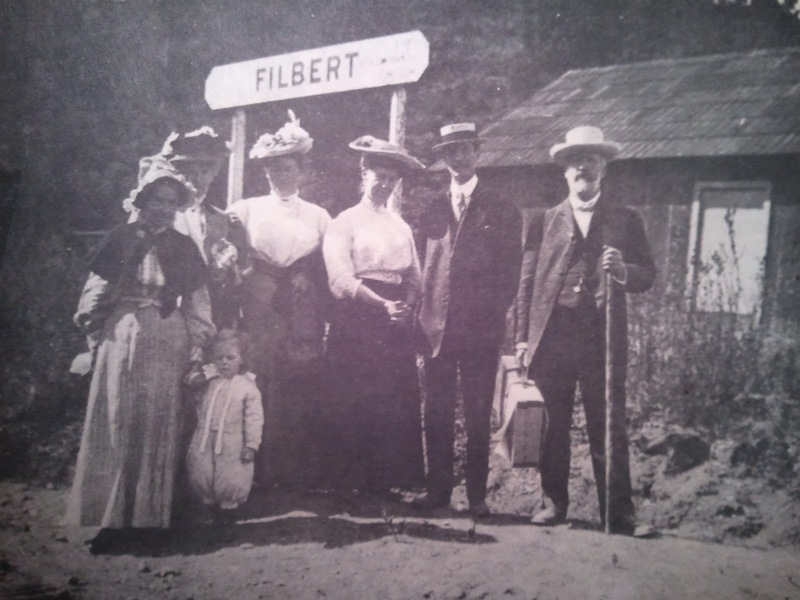 In addition to demoting the stop, Southern Pacific also renamed the station Filbert in 1887. This was probably to avoid confusion with another station named Lorenzo, or perhaps San Lorenzo, but it was an odd choice for a name. It was probably a reference to the California Hazel Tree, which is also named the filbert—although this tree is native to the Boulder Creek area, the nickname is not local and was probably provided by non-local railroad employee. After standard-gauging of the tracks in 1908, Filbert became strictly a passenger flag-stop, suggesting the Lane mill was no longer in use. A passenger shelter was built at this time, probably for visitors to the nearby Redwood Rest resort. In 1916, locals negotiated a new fare for travel between Filbert and Santa Cruz and also were granted permission to pay their fares directly to the conductor, saving them the trouble of traveling to Boulder Creek station to pay for tickets. 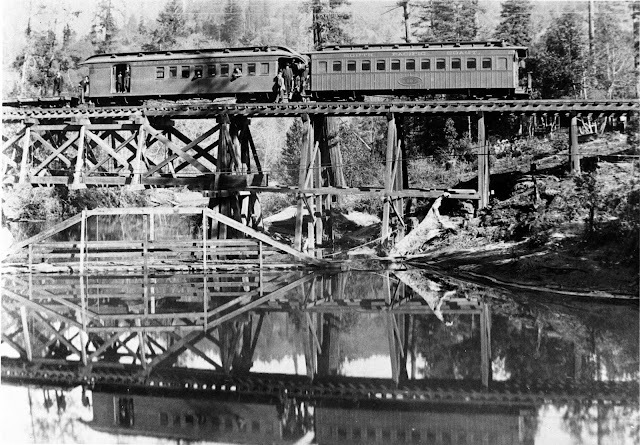 Regular passenger service along the Boulder Creek Branch ended in late 1930, although special excursion trains may have operated after this date. All service ended in January 1934, after which the tracks were pulled and the land sold. 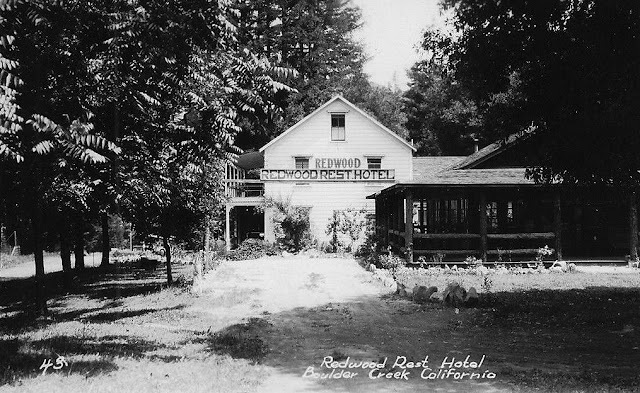 Redwood Rest Resort continued to operate their resort beside the former right-of-way and probably purchased a portion of it after Southern Pacific left the area. The site of Filbert was located near the end of Grove Street on the south side of town. It was located to the northeast of Redwood Resort RV Park, which marks the former location of the Redwood Rest Resort. While portions of the right-of-way survive in this area and can be observed on Google Maps, the majority of the land has been developed for private use and trespassing upon any of it is not advised. 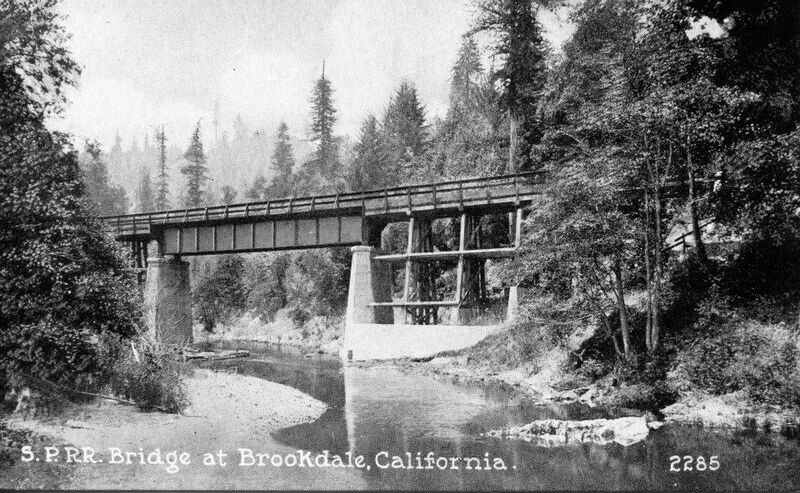 It should come as no surprise that the mile between Brookdale and Boulder Creek used to host a thriving lumber industry. 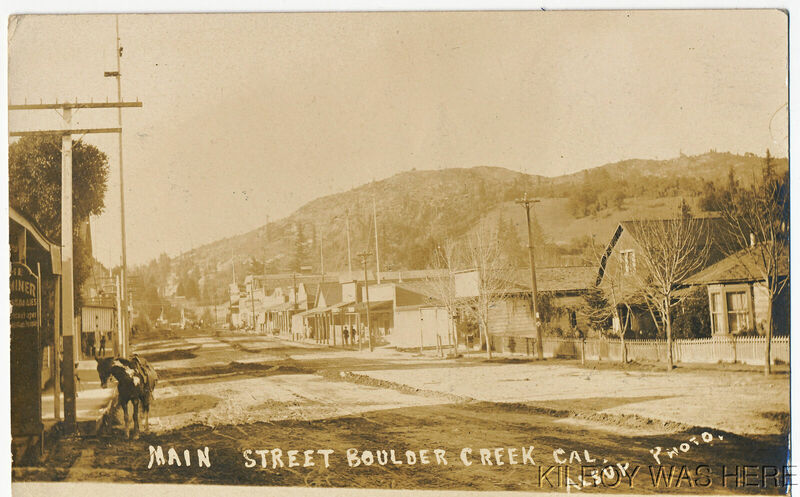 Both the village of Brookdale and town of Boulder Creek began life as lumber settlements, and the stretch between the two locations was not immune from this industry. 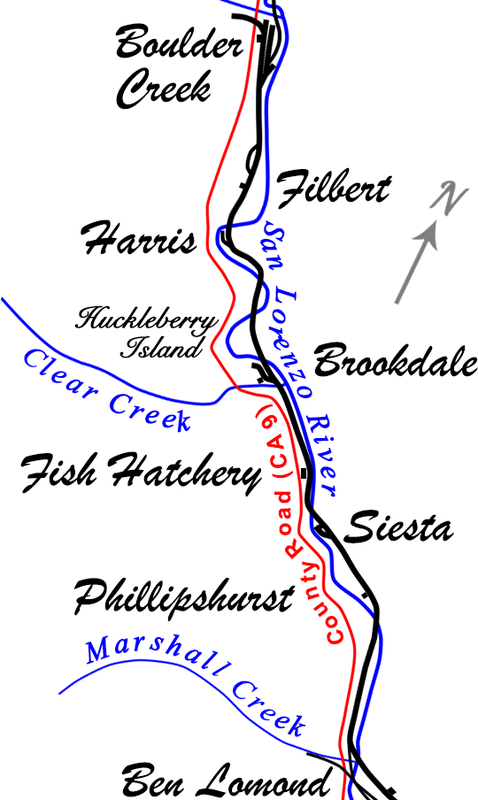 Midway between these two settlements, a succession of shingle mills operated on the east bank of the San Lorenzo River. The earliest reference for a mill at this location is in late 1884, when Felton general store owner and local magnate James F. Cunningham relocated his lumber operations from Felton. Daily operations at the mill were overseen by the firm of Dabadie & Morgan, and the mill was capable of producing 60,000 shingles and shakes per day. The timing of the relocation suggests that Cunningham waited until the Felton & Pescadero Railroad was built before investing in operations this far north. 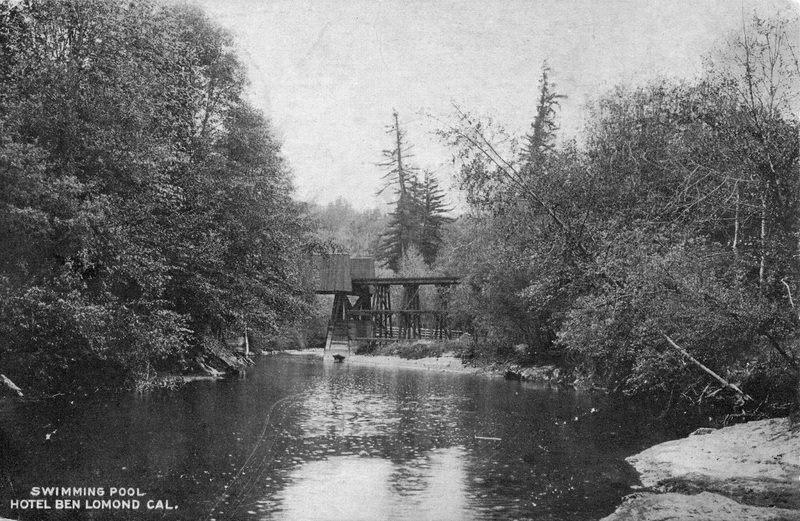 The flume, which was dismantled around this time, was not able to transport anything smaller than cut lumber, so split stuff needed to be hauled to Felton by wagon. The fact that the mill sat on the relatively inaccessible east bank of the San Lorenzo River undoubtedly made this option unfeasible. As soon as the railroad line was completed, a location called "Cunningham's" appeared in agency books. The stop included a pair of spurs that together measured 668 feet long. Cunningham's mill and all of its contents, as well as a piece of rolling stock, burned on November 20, 1890. 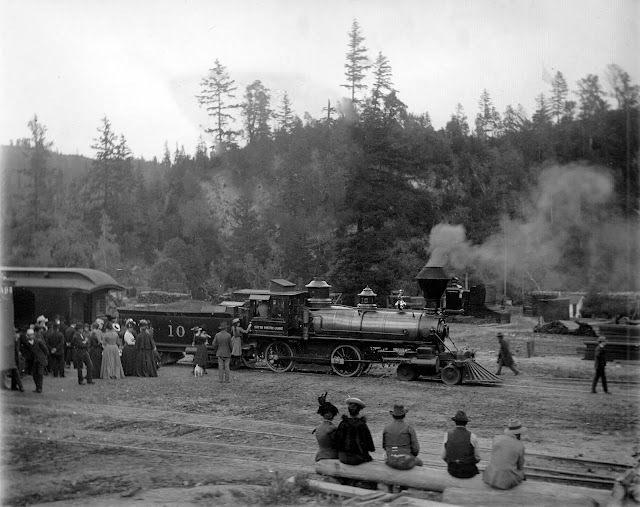 From this point forward, Cunningham focused all of his attentions thereafter on his much larger lumber mill north of Boulder Creek along the newly-constructed Dougherty Extension Railroad. Sanborn Fire Insurance map of the Boulder Mill Company mill south of Boulder Creek, 1892. In early 1891, the Boulder Mill & Lumber Company took over operations and the railroad renamed the stop "Boulder Mill." Unlike Cunningham's operations, the Boulder Mill Company sought to actually cut lumber for shipment out of its new mill. A Sanborn Fire Insurance map of the property shows two railroad spurs passing through stacks of lumber, with one stopping on the edge of the river and the other at the entrance of the mill. The San Lorenzo River behind the mill was dammed so as to act as a mill pond. 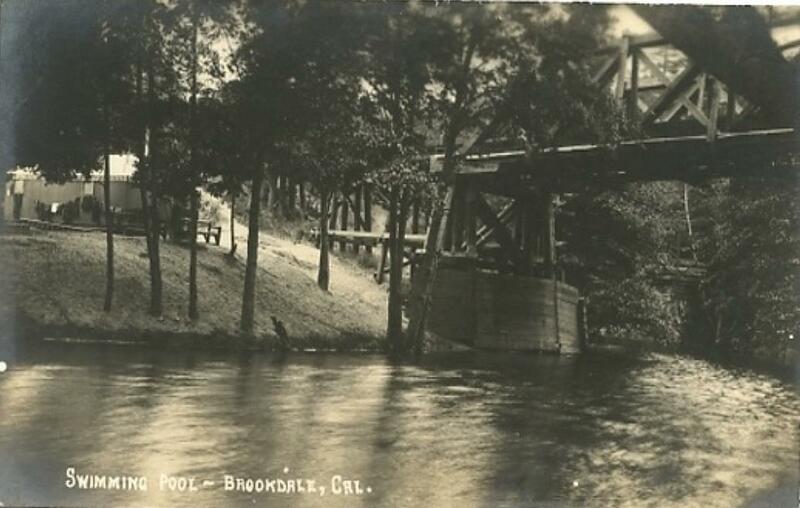 A bridge was erected over the mill pond to allow wagons and other vehicles to enter the property from Boulder Creek. beside the central track and along the road that passed through the property, a small freight office shack was built. When running at maximum efficiency, the mill could produce 20,000 board feet of lumber per day. The Boulder Mill Company became delinquent on some of its taxes in 1893 and, as a result, the mill was sold to a local lawyer, J. M. Green, on June 17, 1895. Grover & Company Mill as depicted on a Sanborn Fire Insurance map, 1897. Within a few months, Grover & Company took control of the abandoned Boulder mill south of Boulder Creek. The company was well-established in Santa Cruz County by this time, although they had very little presence within the San Lorenzo Valley. 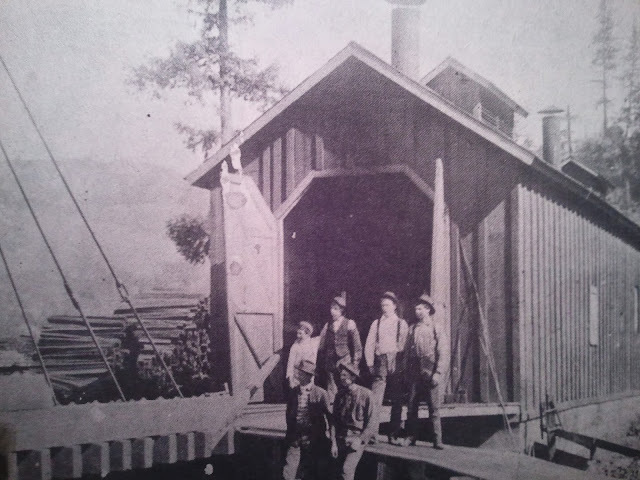 The brothers J. Lyman, Stephen F., and Whitney had all been in the lumber industry since the 1860s and had their main base of operations north of Soquel in what would later be named Grover Gulch (now Glen Haven). Throughout the 1890s, they leased timberland in Scott's Valley, Santa Cruz, the North Coast, and in the Clear Creek area. 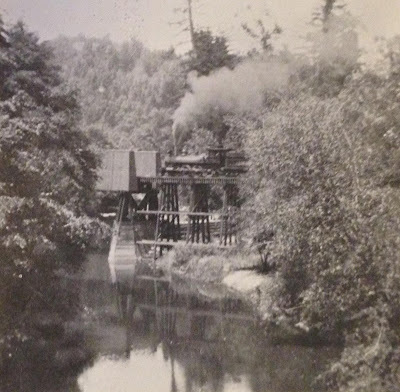 The Grovers only operated their mill near Clear Creek for a few years and soon became involved in the development of the area into a resort alongside Judge John H. Logan. The mill itself changed very little in the time that it was under Grovers' management. Indeed, the railroad never bothered to change the name and it continued to be referenced as the Boulder Mill throughout this period. By 1900, the mill was abandoned and the buildings were demolished or moved to other locations. The abandoned Grover & Company property according to a Sanborn Fire Insurance map, 1901. By 1901, only the basic layout of the old mill remained. The two railroad spurs, the office, and the mill pond were still left intact, but nothing else survived the demolition. Standard-gauging of the line in 1908 appears to have removed the spurs, but the office remained behind. In 1902, part of the Grover property was leased to G. Ellingwood Joy, who founded a retreat for the Sacramento Boys' Brotherhood here. Camp Joy, as it became known, was an outdoor camping area that catered to primary- and secondary-aged boys. It included all manner of sports and hosted a national park guide and culinary chef. Besides outdoor activities, the camp supported academic pursuits such as study and research. It was in 1910 that the location finally appeared on railroad timetables as an additional stop called "Joy Camp," clearly implying that some railroad traffic stopped there during the summer months. Original mill owned by the Grovers in Glen Haven. 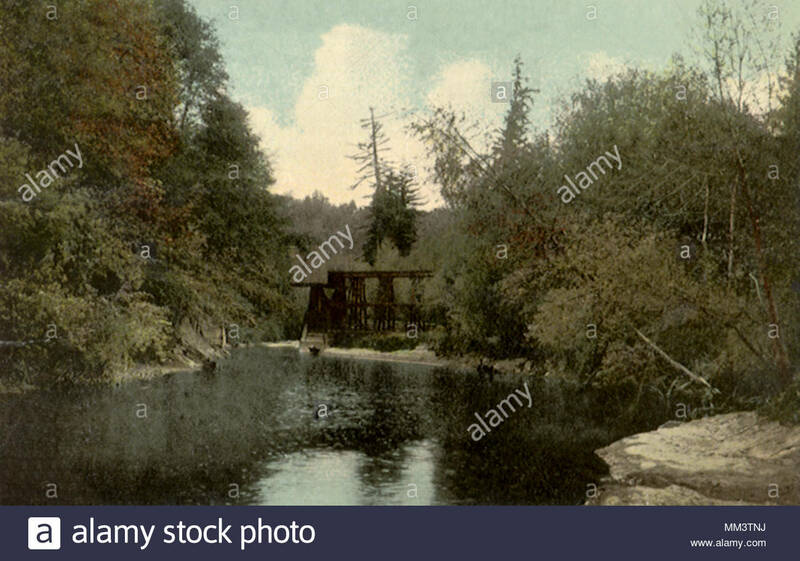 No known photograph exists of the Boulder Creek mill. Only a year later, Joy Camp was renamed "Harris," although both the reason for this change and the name itself remain a mystery. Newspapers at the time make no reference to it and even Donald Clark, the famed local etymologist, could not guess at the origin or reason. The best guess is that it was named after a former Southern Pacific railroad detective named Leonard Harris, who was killed in a shootout in Boulder Creek in 1894. Perhaps some of the more studious campers at Camp Joy did some research and rediscovered this felled hero and recommended the name change. In any case, Harris appeared on employee timetables as a flag-stop in 1910 and remained through the rest of the branch line's existence. Regularly-scheduled passenger service along the Boulder Creek Branch ended at the end of 1930, but it is unclear when service to Camp Joy ended. It may have terminated earlier, or it could have continued even after passenger service ended via special excursion trains. All service ended in January 1934 and the tracks were pulled soon afterwards. The only part of the old railroad presence there to remain was the office shack, which continued to sit on the old mill property just to the south of Camp Joy. The site of the mill is located on private property and trespassing is prohibited. The right-of-way to from the southeast off Irwin Way remains intact as a long driveway while a single concrete pier over the San Lorenzo River is still standing to the north of the site. According to the owner, the old mill office shack was incorporated into the current private residence, which dates to 1911. To the east, Camp Joy has been subdivided several times, but a portion remains as Camp Joy Gardens, which was established in 1971. Santa Cruz Sentinel and Santa Cruz Evening News, 1884-1934.